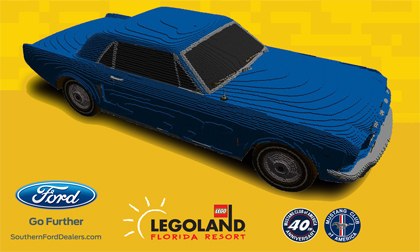 PENSACOLA, Fla., Aug. 09, 2016 – LEGOLAND® Florida Resort, the ultimate interactive LEGO destination for children ages 2-12, will unveil a 1:1 replica of Ford’s iconic “1964½” Mustang coupe during Mustang Club of America’s 40th anniversary celebration. Built brick by brick at The LEGO Group’s U.S. headquarters in Enfield, Conn., the life-size model will make its public debut at the legendary Indianapolis Motor Speedway on Thursday, Sept. 1. Partnering with long-time sponsor Southern Ford Dealers, the resort wanted to build a life-size Ford vehicle that would resonate with guests of all ages. Created with thousands of colorful LEGO® bricks by a team of veteran Master Model Builders, the stunning model re-creates the first Ford Mustang, which debuted at the New York World’s Fair on April 17, 1964. Towed in a see-through trailer decorated with colorful LEGO graphics, the model Mustang will participate in MCA’s Mustang Parade at Indianapolis Motor Speedway on Friday, Sept. 2, an event that also will feature Mustangs and MCA clubs from around the globe in an attempt to break the record for the world’s longest Ford Mustang parade. After its initial appearance in Indianapolis, the LEGO® Mustang will make several stops around the country before arriving at the popular, kid-sized Ford Driving School attraction at LEGOLAND® Florida Resort, where it will remain on permanent display. For more information about the LEGO® Mustang, visit the resort’s official blog at http://www.llfblog.com and follow its progress through social media with hashtag #BrickPony. Built for kids 2-12, LEGOLAND® Florida Resort is a multi-day vacation destination in Winter Haven, Fla., that includes a 150-acre theme park with more than 50 rides, shows and attractions, and a separate water park. Opening in 2017 is LEGO® NINJAGO® World, an immersive land with a groundbreaking, interactive ride inspired by the popular LEGO toy series and companion TV show, and LEGOLAND Beach Retreat, a lakefront resort with 83 themed bungalows offering 166 separate accommodations. LEGOLAND Hotel, located just steps from the theme park entrance, features 152 rooms and suites, each with its own LEGO theme and some with beautiful views of Lake Eloise. For more information, visit http://LEGOLAND.com/florida.